Home › Investing › Retirement › Estate Planning › What Is A Springing Power Of Attorney? A power of attorney gives another person wide-ranging powers over your financial and medical affairs, but what is a springing power of attorney? 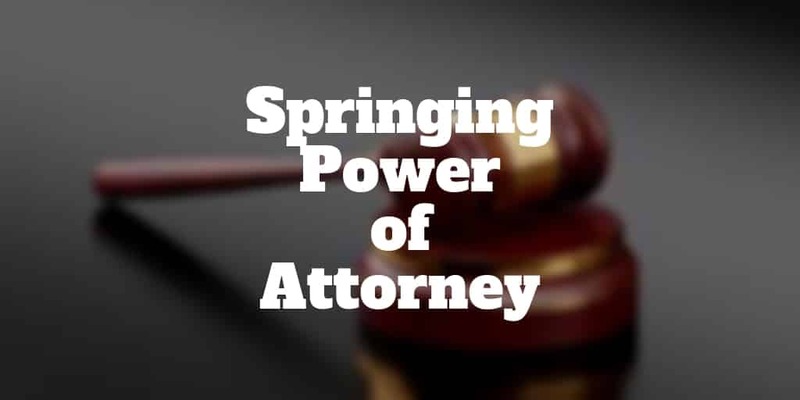 A springing power of attorney is often called a conditional power of attorney. It “springs” into effect only when certain conditions have been met, such as when a person becomes incapacitated. Both general powers of attorney and healthcare powers of attorney can be made into springing powers of attorney. For example, if you wanted someone to have control only over your medical decisions in the event you became disabled, you could create a springing healthcare power of attorney. Springing vs Durable Power Of Attorney? If you are trying to decide what power of attorney is best for you, a springing vs durable power of attorney may leave you scratching your head. Which should you choose? The primary difference is that a durable power of attorney takes effect immediately after executing legal documents. A springing power of attorney, on the other hand, takes effect only when conditions are met, such as if you became mentally incompetent. A durable power of attorney might be a good idea for someone who, for example, has been recently diagnosed with dementia, still has their wits about them but expects to become less cognizant over time. They might decide that an adult child can better manage their finances in the future so, while compos mentis, choose to take legal steps to hand over control. A power of attorney is not a legal document to be taken lightly by any means. A healthcare power of attorney hands control over medical decisions to another person while a durable power of attorney empowers someone with control over your finances too. If you have any concern over the financial responsibility or ethical behavior of the person, be very careful and reticent to transfer power to them because they have broad jurisdiction over your bank accounts, brokerage accounts, real estate assets, and most any other assets you own too. Should you decide to create a springing durable power of attorney, be very specific about the definitions and language used. A very clear legal distinction should be made so the power of attorney only takes effect when certain triggers are met, for example mental incapacitation. A power of attorney hands over so much control that you should be fully confident you can trust the person to whom you are handing the authority. If you are having second thoughts about a full power of attorney, you could begin by selecting a springing power of attorney. However, if those niggling thoughts about signing a power of attorney form are because you don’t fully trust the person who will be entrusted with control over your financial and medical affairs, then you may be wise to not proceed period. Do you have a better understanding of the different types of powers of attorney and how a springing vs durable power of attorney compare? Share your tips about smart estate planning below, we would love to hear from you.